Each of the units (280 in each tower!) 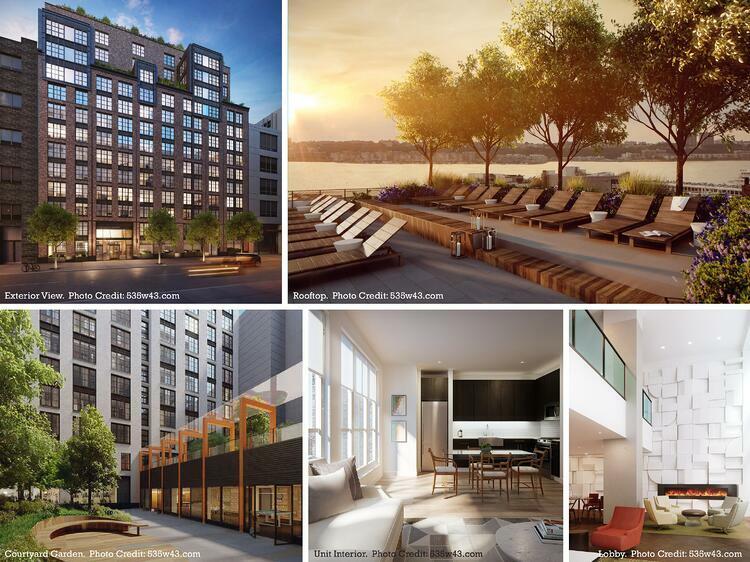 is equipped with ebonized millwork, stainless steel appliances, white Caesarstone countertops and blonde Swedish oak flooring. Impressed yet? Just you wait…this place is far from half-baked. As a resident, you will enjoy a fitness center, pet spa, laundry, valet service and soundproofed media room. From gritty to glamorous, the Hell’s Kitchen neighborhood has truly transformed and taken flight. So the developers called in the "celeb chefs" to cook up a crazy cool feature sculpture in the lobby space. Yellow Goat Design, in collaboration with CetraRuddy and One Lux Studio, designed and fabricated an abstract cluster of "wings" to suspend central to the concierge desk. Side note: our “kitchen” and process was a bit more enjoyable than that of Gordon Ramsay. The recipe for this sculpture is pretty straightforward…but we all know it’s the ingredients (and the skill!) that count. 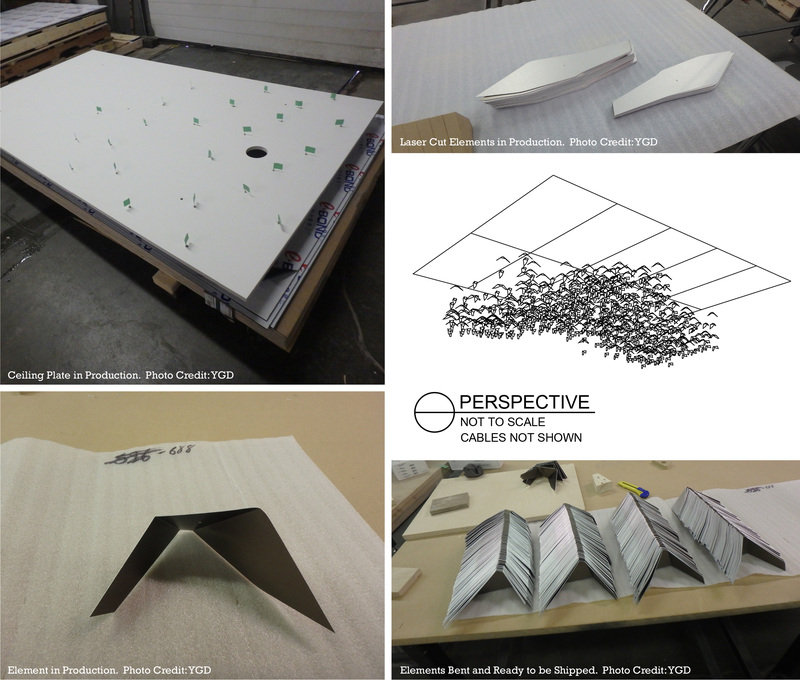 YGD designed an installation that spans roughly 20’ x 14’ overall. 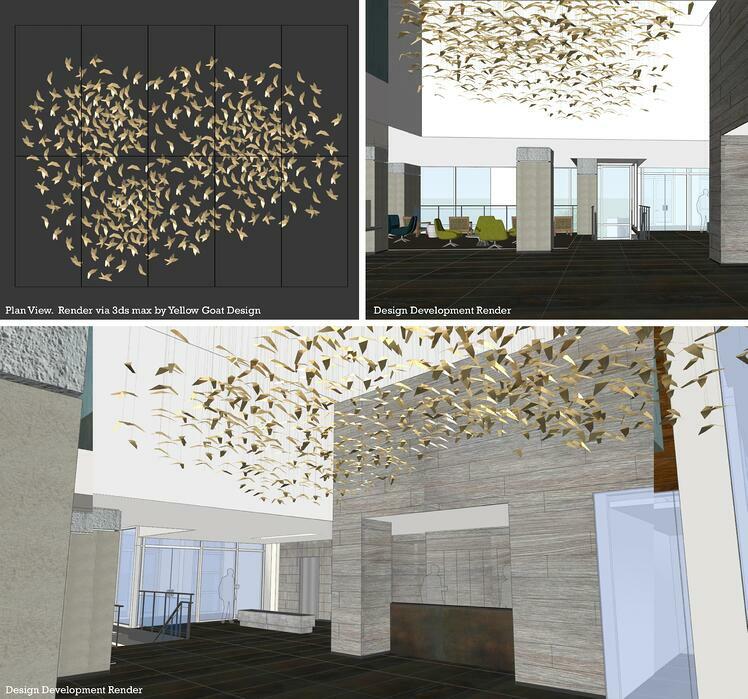 775 brushed bronze aluminum ‘wing’ elements are suspended via stainless steel wires from a ceiling plate and drop 4’-7” below. We painted the ceiling plate Benjamin Moore Vanilla Milkshake to coordinate with the surrounding interior finishes. The feature is designed to have three strand types, each with a mixture of 2, 3 or 4 elements each. This allowed YGD to create variance and movement using one abstract wing shape. When installed, the breeze allows for the elements to sway slightly and appear even more dynamic. We’d say this deserves some Michelin stars, don’t you think?! Ready to move in? Visit the property’s website here: http://535w43.com/. Also, check out the portfolio of CetraRuddy and One Lux Studio and show them some love! Want your YGD project featured on our blog and in the next newsletter? I'm taking requests...drop me a line here!